At the start of this mesmerizing new installment in the Immortals series Ever and Damen are still separated by the poison lingering in Damen’s body. Their only hope of being together is the antidote that was spilled on Jude’s shirt when he killed their enemy Roman. Now Haven is in possession of the shirt—and she’s out for revenge. Blinded by rage and grief, Haven— who blames Ever for killing Roman—could be Ever and Damen’s deadliest enemy yet. Ever is forced to make an impossible choice—allow Haven to destroy her and her dearest friends, or send her to the Shadowland, the abyss for lost souls. Now where to start with this book... definitely not what I expected but in a good way! This book was a rollercoaster, with ups, downs and wows. Night Star is a fantastic, action packed story with a touch of Magick. The book focuses around Haven and Ever’s hate for each other, and how one wants to turn the other into a pile of black ashes. To be honest I was locked from the first chapter, which was epic. At the time I was wishing it was real but of course, the Haven Ever showdown was a manifestation. The real showdown was where it got interesting. It is such a complex plot with so much happening it’s definitely different to the other books in the series. I mean this book is fantastically written, but it’s like loads of plots in one book, that all work in sync and follow on from each other. One thing that did irritate me though is that Ever doubted Damen... again. No offence but it’s like in every book Ever finds a different way to doubt him, or to find a secret he’s been lying about, which is awesome, because I love secrets, but repeating the same thing? I’m not sure. Now in Night Star, Miles, once a very minor character, gets a major role, being friends with two enemy immortals both trying to get him on their side while he secretly uncovers their secrets. I really would like to see what happens to Miles in Everlasting. My favourite character from this book was definitely Jude because he wasn’t playing mind games with Ever or playing dirty to get her but he was just really sweet and understanding and even when Ever chose Damen he still tried to help her, which brings me onto the Showdown! The showdown is an action pact segment of the book which is amazing. In the showdown there is: Jude, Ever, Damen, Haven, Roman’s House, Roman Shirt (with the Elixir), a fire, and a whole lot a fighting. My favourite scene by far. It was so intense and no one knew what would happen. And then Haven dying so suddenly, I though Haven would make it all dramatic before being shoved to the Shadow land. The Shadow land has me confused because all we learned about the Shadow land in Shadow land isn’t completely correct, because Ever escaped from it with no help! Let’s just hope Haven doesn’t figure it out. 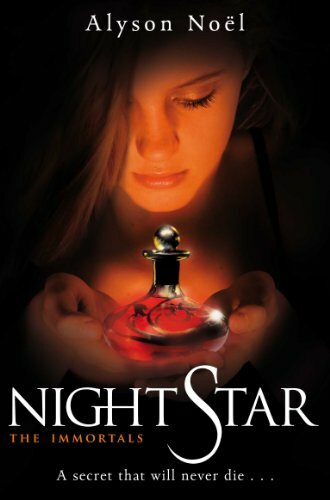 I’ll have to say Night Star is a fantastic, magickal, and beautifully written piece. It is by far my favourite in the series so far and I absolutely adore it. I just want NEED to read Everlasting now.